Phloem: Molecular Cell Biology, Systemic Communication, Biotic Interactions is a timely collection of research on the cellular and molecular biology of this plant vascular tissue. Recent advances in phloem research have revealed the centrality of this plant tissue to whole plant development and physiology. Building on advances made through developments of new analytical technologies, this book will provide readers with a current and comprehensive reference on the role of phloem in plant growth and development. 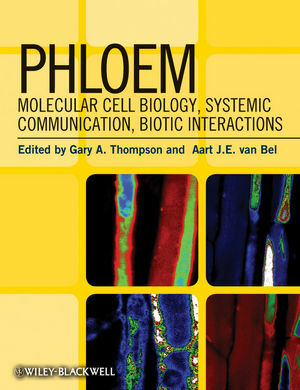 Collecting the work of a global team of leading researchers, Phloem will provide the reader with a valuable synthesis of the latest research in a single volume. Gary A. Thompson is the Associate Dean for Research and Graduate Education, Director of the Pennsylvania Agricultural Experiment Station, and Professor of Plant Sciences in the College of Agricultural Sciences at Pennsylvania State University. Aart J. E. van Bel is Emeritus Professor and Head of the Department of General Botany and former Director of the Botanical Garden at Justus-Liebig-University.